Bill Creek meets Willow Creek at a juncture often noted as a sacred place by the Ute Indians. Both flow year round. At the southern end of the Never Summer Range below Cascade Mountain lies a beloved place called Vagabond Ranch. Bill and Willow creeks meet just upstream of a wooden bridge on the property. Listen and you will hear it - the cleansing sounds of nature. Vagabond Ranch is an inholding, an area of private property surrounded by the Arapahoe National Forest, with approximately 3+ acre feet of water rights for household, pond, irrigation, and hydropower. There are cabins from the 1890s to the 1990s: The main house (Ranch House), a large log house for a caretaker or guests (Cascade), a maintenance building (Gravel) with generators, inverters, batteries and miscellaneous maintenance equipment, a dining hall, once a gathering place for boys and girls on vagabond adventures to explore and appreciate the grand West, Parkview Cabin (1923), Riverview Cabin, a corral and shed, a log structure for one outdoor furnace, a barn foundation, and falling into history, Porphyry, Trappers, Wranglers, and Hill cabins, and a gazebo, lovingly built by Charlie Pavek for his wife, Veronica. The Vagabond buildings are all in decline. Extensive remodeling in the 1990s under stellar stewardship by the Kelleys is showing wear. It's the incomparable land, the rushing water and the privacy: a perfect sweep of the eye from meadows to mountain views, the rush of two year-round creeks, Bill and Willow, and two seasonal creeks, Loyal and Ashbrook. It's the breathtaking morning light and the afternoon glow on Cascade Mountain, practically in the front yard, and the views of Porphyry, Gravel, and Parkview mountains that make this place remarkable. Once you're here, you do not want to leave. The ranch is entirely off-grid; it uses no commercial electricity. There are 13 buildings on the ranch. Three - Ranch House, Cascade, and Gravel - are capable of year-round use. Each of these is equipped with large propane tanks, which power indoor propane boilers. These buildings are also equipped with outdoor pellet burning boilers. The pellet boilers heat the water in the propane boilers such that when things are operating normally, the propane boilers don't burn propane because their water is already hot. By this strategy, the ranch can stockpile pellets for the year sufficient to heat the three buildings and the propane boilers act as backup. Ranch House is home to the owners who have a sentimental attachment to its origins, one having laid the rocks for the foundation in 1955 with a group of other kids. Cascade is intended for a caretaker's lodging or as a guest house. Gravel, the maintenance building, is heated because it contains three generators, which come to life automatically as necessary. Gravel also contains large batteries and inverters which supply electricity throughout the ranch. The switch from one to another though is done manually. The generator comes to life when the battery needs charging and when the sixteen solar panels are unable to satisfy demand. Generator #1 is primary. If it fails, generator #2 comes to life. Generator #3 is an emergency fallback. Some folks buy thousands of acres to insure privacy and isolation. In a sense, Vagabond Ranch is that way as well. It is 108 acres of private property in the midst of 700+ thousand acres of the Arapahoe National Forest. You buy the 108 acres and enjoy thousands of acres of privacy and genuine wilderness. The privacy and seclusion of the 108 promote the notion of 700,000 acres. Night times are clear beyond description. There is no light pollution. Starlight provides natural illumination. 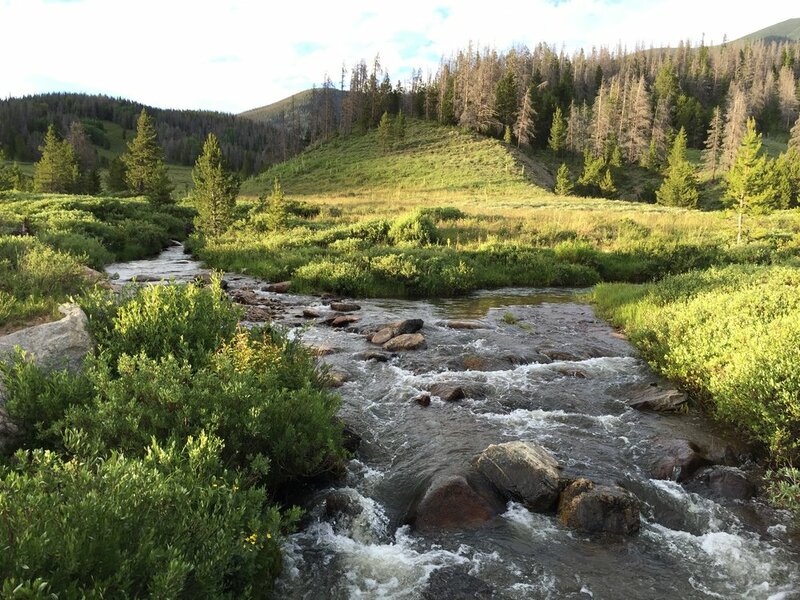 Located on the headwaters of the Willow Creek drainage, 4 miles east of Colorado route 125, 22 miles north northwest of Granby and 11 miles west of Grand Lake, the ranch, at elevation 9200 feet, is truly off by itself. Vagabond is currently not for sale, but we are getting older. If it's not our children who continue to love it, we hope for someone to cherish the land and its history.